If there is one thing I learned from my mum is that a chef should not be solely judged by how they prepare their lobster or a white truffle dish. Instead, we should look at what they are able to create with simple and accessible ingredients, cheap cuts of meat which require real technique to turn them into something delicious and the amount of flavour they are able to extract from humble ingredients like celeriac. Typically made into salads or slaws in Germany, celeriac only really started to grow on me when I happened upon a celeriac mashed potato recipe in one of Jamie Oliver’s earlier books. While not as starchy as potatoes, celeriac adds a distinct flavour to potato mash, sweet and peppery, which I really like both with grilled fish and braised beef dishes. Celeriac is not something Romans typically cook with (and I remember endlessly walking around my favourite market here in Rome last winter, a photo of celeriac on my phone and asking every single stallholder in vain where I could find some), so when I finally stumbled upon some a few weeks ago at a market in Testaccio I was determined to make the most of it. Of course there was potato and celeriac mash, alongside steak this time. And then there were some sweeter experiments using celeriac as well. Naturally sweet once cooked, using celeriac in desserts is actually not too far-fetched (even less so when you think of how commonly carrots or parsnips are turned into cake). Although coming up with a winning flavour combination proved challenging. Initially, I wanted to make a white gingerbread cake – replacing the commonly used stem ginger and syrup with candied celeriac and replacing the treacle with the syrup from candying celeriac. As for the spices, I wanted to use a bit of nutmeg or mace to underline the peppery notes of the celeriac. Alas, this sounded much better in my head than when I tried the actual cake which had a nice texture but was neither very tasty nor was the celeriac easy to detect. I am still intrigued by the idea of a white gingerbread cake (which may not end up containing any ginger at all, in which case I will need to think of a suitable alternative name) and will re-visit this idea in due course. What did work really well the first time I tested it was a simple dessert marrying the flavour of celeriac with coffee, walnut and vanilla. 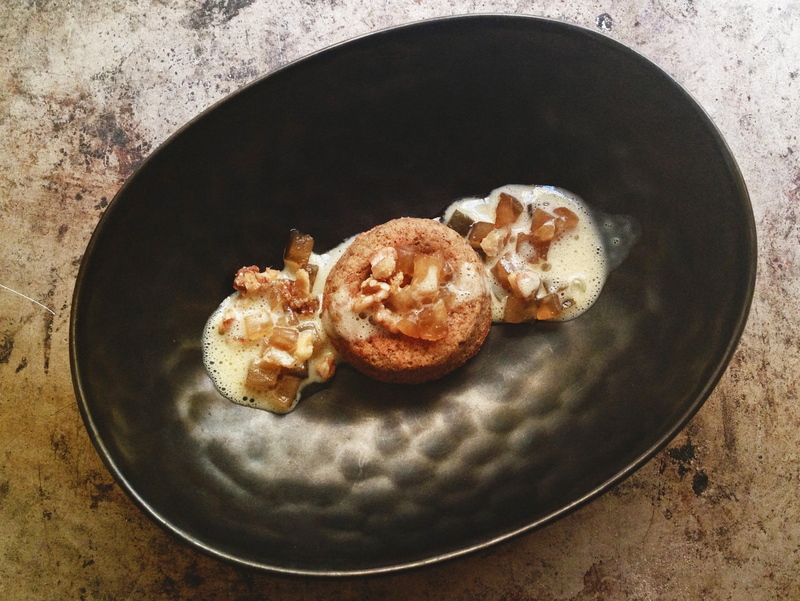 The dessert you can see in the above picture consists of four different elements: candied celeriac, a crème anglaise, coffee and walnut mini cakes and caramelised walnuts. I candied the celeriac (using a 150g piece, peeled and diced finely) adapting a recipe from David Lebovitz for candying ginger, blanching the celeriac once only and using muscovado sugar for its caramel undertones. I then made a simple vanilla crème anglaise (ca. 1/4 litre) and a small batch of mini coffee and walnut cakes based on my baked doughnut recipe (half the quantities so you just get 4 doughnuts, replace the breadcrumbs with ground walnuts and add 1/2 teaspoon finely ground espresso to the dry ingredients). Lastly, I caramelised a small handful of walnuts using the same technique as for these caramelised buckwheat groats. Although this isn’t the full recipe, this roadmap of sorts will get you to the finished dish (with maybe some candied celeriac to spare, not a bad thing in my opinion, I think it would be delicious on top of some vanilla ice cream). Rather than share a precise recipe I wanted to share this dish as a work in progress, maybe as a way to start a conversation. I would love to hear about your kitchen experiments (and fails! ), any unusual flavour combinations that really worked (or that really did not work) or any experiments that you are currently working on. And if you don’t fine the idea of a sweet celeriac dish entirely off-putting, Sat Bains has some more ideas for sweet dishes using is and so does Hugh Fearnley-Whittingstall (and although it is still a bit too cold for me to really crave ice cream and I really should be packing up my ice cream machine, I am rather tempted by Hugh’s idea for a celeriac ice cream). I should also say that things might be a little quieter around here for a couple of weeks or so. My boxes are packed and will shortly be sent off to Brussels. I should hopefully have all my stuff in my new kitchen in Brussels before the middle of April so give or take a week or two, I hope to be all set up in my new kitchen by the end of April at the latest and will then be back to my regular posts.